Home » Commentaries » Is there an App Gap or a Great Disconnect? Is there an App Gap or a Great Disconnect? An Interview with Justin Serrano: Is there an App Gap or a Great Disconnect? 1) First of all, tell our readers about yourself, what you do and what you research. My name is Justin Serrano, and I am the president at Schoology, a K-12 learning management and assessment platform. Before I joined Schoology a little less than a year ago, I spent my career working in education, including 17 years at Kaplan Test Prep, where I ended up running the K-12 and college prep business. More recently, I was CEO of Generation Ready, a professional development partner working with superintendents, principals and teachers across the country to elevate student achievement. 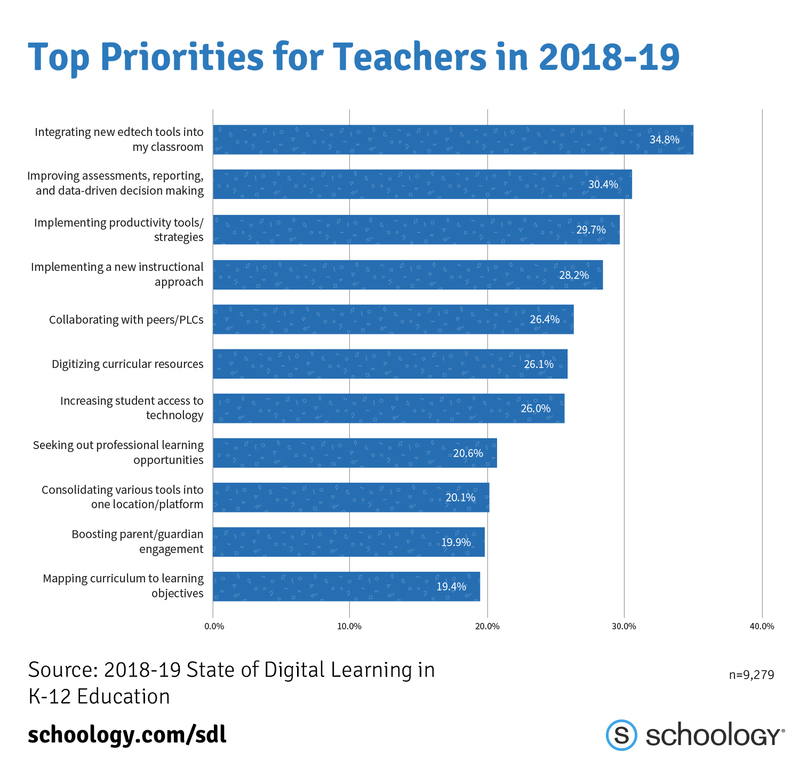 In May and June 2018, our team here at Schoology, for the second year in a row, conducted a comprehensive survey of digital learning in K-12 education. The resulting report takes into account responses from 9,279 education professionals, only a small portion of whom are Schoology customers, giving us a very diverse look at K-12 education in the U.S. We know edtech plays a major role in education, but when it came to the actual reach of technology and digital innovation in learning, there was more to explore. We were intent on gathering insights and discovering what’s really happening in education straight from the source. Our objective with this research was to gain a deeper understanding of the current state of digital learning and to create a trove of data-backed insights to support our efforts in transforming education and learning for students. 2) Now, let’s start with the “app gap.” What is YOUR definition of the “app gap” and what causes it? Schoology has a unique perspective on this question since our platform is used in every conceivable kind of school or district possible. Schoology customers include Los Angeles Unified School District, which has more than 700,000 students, and other urban districts such as Cincinnati, Indianapolis and El Paso. Schoology also works with smaller districts all over the country. Our technology is leveling the playing field for all schools, regardless of size, economic status or location, and empowering every student to be as successful as possible in their education. 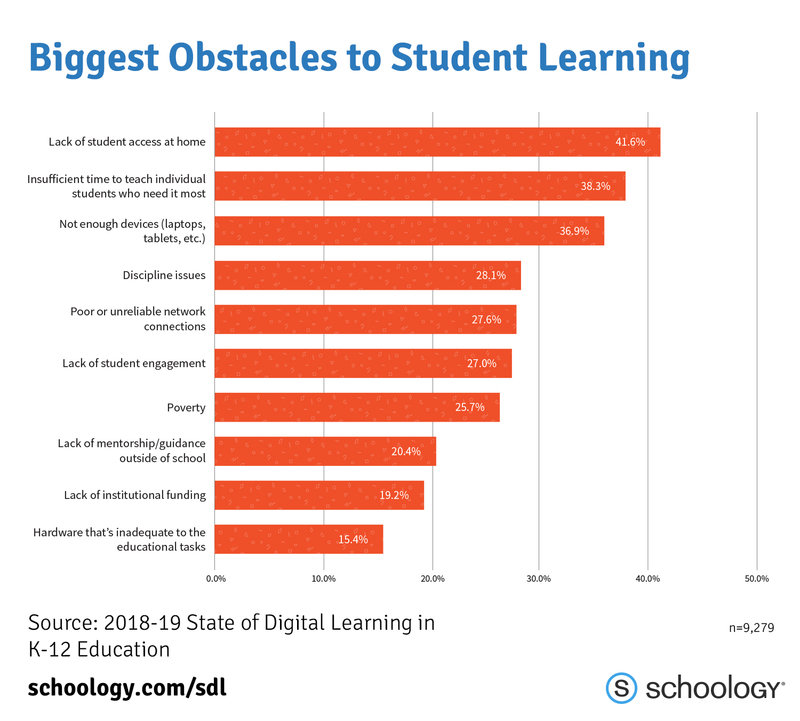 When we asked survey respondents to name the top three obstacles to student learning, almost 42 percent listed lack of student access to devices and internet at home. When we dig deeper and break down this question by demographics, home internet access was a top three issue for 51 percent of rural districts, 32 percent of suburban districts and 45 percent of urban districts. 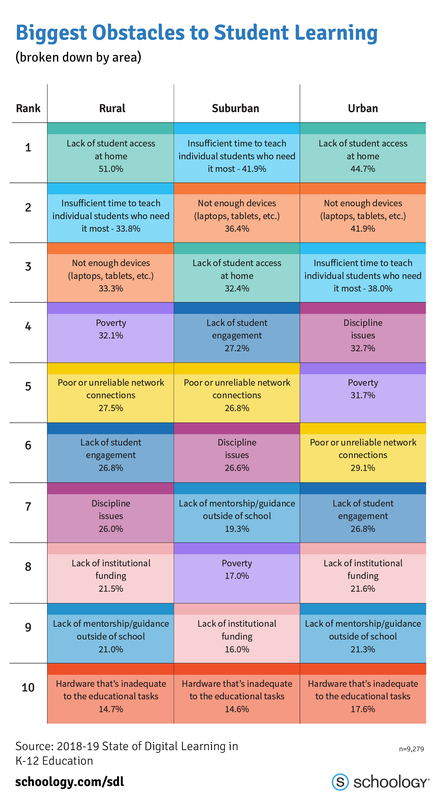 This research illustrates that concerns about device and internet access at home are impacted by a district’s economic position. That’s why we’ve always taken a “mobile first” orientation in our development; more students – and their parents – have access to smartphones than to desktop computers or tablets. 4) Teachers report (at least to me) that kids can text but have trouble navigating around any system. They know about Slenderman, but cannot access information on Wikipedia. Who is somewhat responsible for this sad state of affairs? We cannot speak for the entire tech industry. Instead we focus on building great tools that K-12 students want to use. When K-12 schools choose education technology originally designed for higher education and adult learners, students end up getting frustrated, and engagement suffers. For Schoology, we think that issue can be addressed by having K-12 schools use software designed for use in K-12. 5) What is this tech bloat that you talk about? Our strategy is to fold more functionality into our platform so that educators can have an integrated experience. For example, we added assessment management to Schoology so teachers and administrators could use the same set of tools for teaching as they do for formative and benchmark assessments. By allowing teachers as well as curriculum and assessment teams to collaborate on building, managing, and measuring common formative and benchmark assessments, classroom instructors get a more comprehensive view of student performance, can better evaluate the effectiveness of curriculum, and can still satisfy all reporting and regulatory requirements. 6) Justin, some faculty are INUNDATED, and I put that word in capitals for a reason in that we are continually confronted with new platforms – one year it is Web CT, the next year Blackboard- and I live in fear of some new platform coming along – am I alone in this? This is not a significant issue for Schoology customers. We have incredibly high renewal rates. Since we are a SaaS business, our customers have the right to switch providers each school year. Still, 95 percent of them renew and stay with us year after year. First, we build software that teachers and students love and want to use. Second, we continue to listen to our customers and innovate new features that customers get excited about. Third, we are an open platform that allows our customers to easily integrate their preferred curriculum and content tools. 7) Do we have a cogent coherent curriculum – K-12 to really teach and orient students to new technologies? This was one of the most inspiring responses from our research. Nearly half of respondents report that their institutions are using coding in classrooms. Coding is the most prevalent emerging technology trend this school year. Luckily, learning to code comes with the advantage of students being able to demonstrate their knowledge of and understanding in a real-world application. 8) Access to laptops – is this a magic cure for the achievement gap or just accessibility? Access to hardware devices in the classroom remains a significant issue in our research. Overall, 37 percent of respondents selected “Not enough devices (laptops, tablets, etc. )” as an obstacle to student learning. This was true in rural districts (33 percent), suburban districts (36 percent) and urban districts (42 percent). This is interesting when we consider the fact that more than 50 percent of respondents said their school or district is 1:1, and more than half of them allow students to take devices home. Schoology has many many district customers that are not 1:1 that still see tremendous value from a centralized teaching and learning platform.